With many photographers upgrading their cameras as soon as a new model is released, there is now a huge range of second-hand models available for sale. Among these are some brilliant bargains, with many cameras costing hundreds of pounds less than when they were bought new just a few years ago. Although the latest technology found in current cameras is superb, this doesn’t mean that overnight the previous generation of cameras is suddenly rendered useless. There have been many cameras over the past few years that have become favourites with photographers because of a specific feature or the model’s image quality, and depending on your needs, hunting down the right used DSLR or CSC (Compact System Camera) could get you the camera you need at a fraction of the price. Which second hand camera is right for you will depend on your type of photography. What we want and what we need are two very different things. I want a 50-million-pixel, full-frame DSLR that can shoot in virtual darkness and produce almost no noise. However, my needs are a little more down to earth. I usually print my images at A4, or occasionally at A3 size. The vast majority of my images are landscapes or travel shots taken outside in daylight. I try to shoot between ISO 100 and ISO 400, with probably 90% of my images taken in this range. I occasionally bracket to shoot an HDR sequence, so a shooting rate of 3-5fps is all I really need and a superfast AF system with lots of points isn’t really necessary. So before you decide which camera you want, think about the features you will actually need for the type of photography you do. If it helps, make a list of the features you lust after on a notepad and have this by your side when you’re browsing the web or camera shops. There are a few features we now take for granted that weren’t available just a few years ago. For example, many macro and landscape photographers rely on live view for pinpoint accuracy in their photographs, but some cameras more than six years old may not have this feature. It’s reasonably unlikely that you’ll come across even a second hand camera that doesn’t have this feature, but somebody who’s kept a high-end premium camera in great condition for close to a decade can offer up a great bargain now. Similarly, sensor cleaning was not included in some cameras until quite late in the range. The Nikon D3, for instance, lacked a sensor-shake cleaning system. The biggest consideration for many people when choosing a new digital camera is the resolution of the sensor. While there is a benefit in having the highest resolution possible, remember that depending on the size of the sensor, this could increase image noise. Also, ask yourself whether you will ever use the sensor to its full potential, particularly if you only ever produce small prints and display most of your images online. As you should print at a resolution of 300 pixels per inch (ppi) for the best-quality images, the easiest way to work out the sensor resolution you will need is to consider the size of the print you will be making, in inches, and then multiply each dimension by 300 (pixels). However, this doesn’t take into consideration the distance from which the print will be viewed. Obviously, the further you are from the image, the less fine detail you will be able to see. If you are making a large poster-sized A2, A1 or A0 print to be hung on a wall, a resolution of 150ppi or even less should be suitable. Use the 300ppi rule for image sizes up to around A4, at which size 8-10 million pixels will produce excellent image quality. To produce an A3 print at 240ppi, an 11.1-million-pixel resolution is required. By being realistic about how you use your camera and print your images, you may find that you only need a camera with a resolution of 10-14 million pixels, and you’ll no doubt find that the majority of second-hand cameras are available within this range. Conversion involves removing the hot-mirror filter that stops infrared light reaching the sensor, and replacing it with a filter that blocks the visible light spectrum and allows only infrared light through. You can try it yourself, but it is better to let a professional. A typical conversion costs £200-£250, and it is usually easier to convert old cameras than current ones. One of the most popular is the 6-million-pixel Nikon D70. These can be bought for less than £100, and they are one of the easiest DSLRs to convert. For around £350 you could have an infrared DSLR. Companies specialising in infrared conversion, include Protech Photographic (visit www.protechrepairs.co.uk/infrared_conversion.html). How many AF points do you really need? Although Nikon has led the way with the number of points in its cameras, many photographers will still only use the centre point and then recompose. If you do this, then as few as nine points may be all you require, particularly if you shoot subjects that will usually be in the centre of the frame, such as wildlife images. Similarly, landscape photographers have time to manually focus, so the AF points may rarely be used. When a new camera is announced, many manufacturers will proudly boast how many shutter actuations the camera has been tested for in a shutter count. In real terms, this number is how many times you can expect to fire the shutter before it breaks. On older cameras this can be around 50,000 times, but in the past five years or so manufacturers have upped this figure to around 100,000 actuations, and many more if it is a professional-level DSLR. However, remember that cameras fail for many other reasons apart from the shutter dying, and many shutters can continue for long after the manufacturer’s estimated life. You can find a list of user-submitted shutter actuations for various popular DSLR cameras at www.olegkikin.com/shutterlife. For example, one user claims that his Nikon D300 had its shutter fired more than 360,000 times before it failed, which is well above the 150,000 that Nikon estimates. When buying a used DSLR, it is a good idea to check the number of times the shutter has been fired. Some people will list the number when selling the camera, but if they don’t you can find out by taking an image with the camera and uploading it to www.shutteractuations.com (Canon and Nikon only). You can also download software which will tell you how many shots a camera has taken. The Exif data of the image will be analysed and you will be told what number image it is. Before parting with any money, decide whether the shutter has plenty of life in it for the number of images you plan to take. Generally, there shouldn’t be an issue, but if you see a camera that has taken more than 50,000 images, especially in a short space of time, then it may have been heavily used and other parts could fail. Of course, professional-quality cameras are designed to be used heavily and often have strong Kevlar shutters to help prevent wear and damage, so you can expect these shutters to last for more than 300,000 shots. Try to find out the number of shutter actuations of the camera (ask a seller to find this out before you buy). 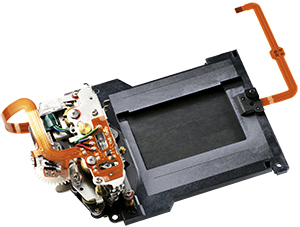 On a film SLR, open the film compartment and check that it is reasonably dust-free and that there are no scratches in the film transport path. Also, check the film pressure plate and make sure it is free from abrasions. On a digital SLR, make sure you put a battery in the camera, and check that the LCD screen works properly and is evenly illuminated. Take a good look through the viewfinder of the camera, with batteries installed. Some Nikon DSLRs, like the D200 (see top ten second hand cameras article), have LCD layers in their focusing screens that require power in order to operate. The viewfinders of these cameras are dull and impossible to focus when a battery is not installed. Check that the hotshoe doesn’t show signs of excessive wear from frequent mounting of a flashgun. If the camera has a painted hotshoe it is easy to check that the paint hasn’t been worn away. Although they have proved themselves much more durable than many manufacturers initially thought, the monochrome LCD status screens on SLR cameras don’t last forever. the LCD screen is sharp and contrasty with no ‘bleed’ of the liquid crystal, and that there are no dark or light patches in the corners. Modern SLR cameras have electronic contacts that carry information between the camera body and the lens. Check that these contacts (which are normally golden in colour) do not show signs of excessive wear or dirt build-up. While you’re in there, check that the camera’s mirrorbox is clean and free of dirt, and that the mirror is unmarked. Although a scratched mirror won’t affect image quality, it could be a sign that the camera has been misused and that other, hidden, problems exist. The film holder or camera back contains the film and determines the format of the image. With a modular camera system the back can be preloaded. Professional photographers may have several backs loaded so they can swap them quickly and continue the shoot. Having an extra back or two also enables a mid-roll change of film, perhaps switching from colour to black & white, negative to transparency. and checked quickly. Unfortunately, most compatible film is no longer made, largely because of the switch to digital backs that allow medium-format digital capture. Some cameras can accept a choice of viewfinder. The basic option for many is the waist-level finder, which has a ground-glass screen that is viewed from above when the camera is held at approximately waist-height. Most waist-level finders have a pop-up magnifying screen, which enables focus to be checked more closely. The image in the viewfinder is laterally reversed so left and right are swapped. This can cause some confusion when composing images for the first time, but it is surprising how quickly you get used to it. Waist-level finders can often be exchanged for compatible prism finders, some of which have built-in lightmeters. A prism viewfinder is held to the eye and gives a correctly orientated view of the world. Many medium-format cameras don’t have a lightmeter built-in, so a handheld device or a second camera with a lightmeter is a useful accompaniment on any shoot. At its simplest, the camera body is a light-tight box with a mirror that accepts a viewfinder, camera back (or film holder) and lens. However, the size of the body dictates the maximum format size.